In recent years, the Arctic has occupied a central place in the urgent discussions surrounding climate change. However, the Indigenous peoples of the region have long understood the need to respect an interconnected environment; they recognize that the land, ocean and atmosphere respond to human behavior. The prints, drawings, stone sculptures, woven baskets, bone carvings and handmade dolls on display in this exhibition demonstrate these values and beliefs. Inuit artists of northern Canada and Yup’ik artists of Alaska created the materials on view during the late 20th century. By producing their art for global sale, these communities established both a source of income and a means of expressing the resilience of their cultural and environmental knowledge. This exhibition was curated from the Museums Collections during an art history graduate seminar taught by Dr. Jessica Horton in the Spring 2018 semester. The members of the curatorial collective are Meghan Angelos, Elizabeth Humphrey, Sara McNamara, Ramey Mize, Victoria Sunnergren, Rebeccah Swerdlow, Zoe Weldon-Yochim and Zoë Wray. 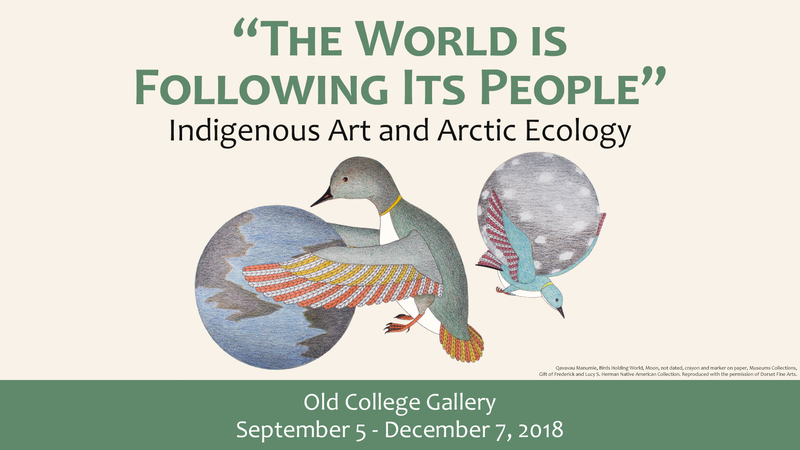 A website that contains research and other resources is available at sites.udel.edu/arcticartecology.